Those of us who grew up in the church sometimes forget how really extreme its teachings are. This was brought to my attention in a recent conversation with one of our pastor’s wives. She shared that since her mother was dark-skinned, she had been rejected by her father’s family when they married. The family put a lot of pressure on the husband to leave his wife and after fifteen years (and two children) he went home to mama, never to contact them again. His wife never divorced him so at his mother’s death, she was legally entitled to half his inheritance. He sent a lawyer who tricked her out of the money and also tried to take her house away. My head was spinning over this family saga of prejudice, greed, unfaithfulness, and lies. In a world without Jesus, this is NORMAL. A few weeks later Dan was doing pre-marital counseling with a young couple who declared they were not going to have children because they were too expensive. Again, I was struck by the world’s warped idea that money is more important than human lives and that this kind of selfishness is okay. 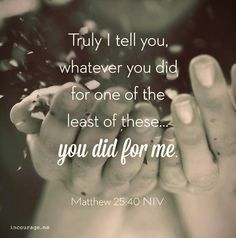 Jesus gave value to the weak and to the despised (the oppressed, the widows, the orphans, the children). We believers know that to love as Jesus loves COSTS something. It means giving instead of taking. Forgiving instead of bearing grudges. Pouring out our lives for others instead of “looking out for number one.” We can only do it through Christ’s power. And when we don’t do it, what a tragic loss to our families and communities! Thanks for this insight. A life without giving is sterile and unsatisfying indeed. I hope the young couple Dan counseled will see the error of their ways. I thank God for the blessing my children have been to me, and I’m sure you say the same. How true and how sad for those who don’t ‘get’ it. I have to constantly remind myself that I am here to love and forgive. It’s so easy to get hurt or feel slighted, ignored or generally not get appreciated… but that’s not what I’m here for; I’m here to love unconditionally, to accept people as they are, to forgive and disregard slights and hurts that most likely were unintentional anyway; to do the appreciating, be interested in others, be concerned, share their joys and sorrows (I have God to share mine). Lord, help me to be Jesus to others!